chipped away parts of the cross for souvenir purposes or in the belief that the cross possesses miraculous powers. 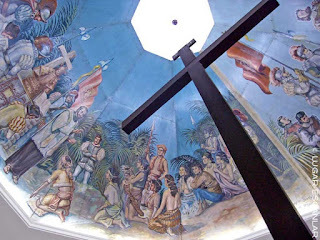 Some people, however, believe that the original cross had been destroyed or had disappeared after Magellan's death, and the cross is a replica that was planted there by the Spaniards after they successfully colonized the Philippines. Magellan's Cross is a symbol of Cebu, and the chapel's image can be found in its city seal. It is also seen as the symbol of Roman Catholicism in the Philippines.